Lyle: This lesson will teach you many ways to play chords for a simple 4 chord progression built all on the dominant 7 chords. You'll also learn and practice different rhythms. Lyle: As you can see in the chord chart, these are all dominant 7 chords. Lyle: This shape is moveable up and down the neck. The root note is on your 5th string. thomas: I think the jam track tempo has picked up since last lesson! Lyle: Use the jam track with the counting if that helps. ZZ: What makes these dominants? Lyle: Try playing along to either of the jam tracks. Listen to the TAB playback to hear what it should sound like or watch the video. Lyle: Dominant chords are major triads with a flatted 7th. Lyle: This time your root note is on the 6th string. Again, these are all moveable. 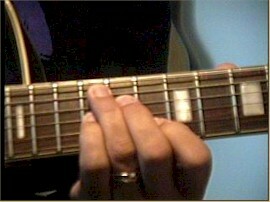 Lyle: Mute the 5th and 1st strings with your fretting hand. radica: Much easier to play. Lyle: In most cases in Jazz, when you see a chord chart like the one you are working with here that has plain dominant 7 chords, you don't have to play just a dominant 7 chord. You can play other dominant chords for extra color. Lyle: Pretty much any dominant. 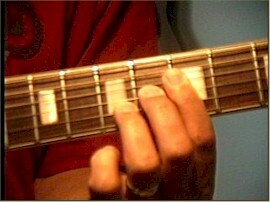 Lyle: The plain dom7 chord such as A7 is built on root, 3, 5, b7. 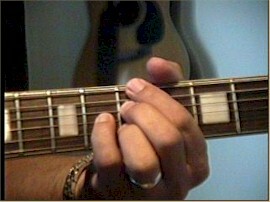 The next dominant chord is the dom9 such as A9. This is built on root, 3, 5, b7, 9. Lyle: These dom9 chord shapes sound real cool, but can be hard to play if they are new to you. Lyle: Notice these 9 chords are more colorful than the 7 chords. And the root is on the 5th string. radica: They have a real chime to the sound. Sweet! 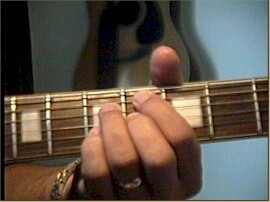 Lyle: Here's another way to play dom9 chords, but this time you don't have a root note fingered. 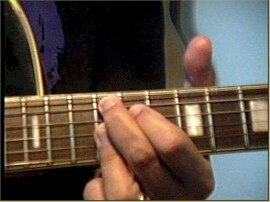 Lyle: Now you can substitute the dom7s with these 13 chords. radica: It sounds cool alternating the 7ths with the 13ths as well! Lyle: Yes, you'll want to learn to mix it all up in any way you like. Many different combinations are available to you now. Now you have learn 5 different ways to play that basic chord progression, and 5 different rhythm ideas! radica: Lot's of info here to digest! Lyle: Next lesson I try to show you a couple ways to play melodies and improvise over this progression.